Last year our oldest Jack had a story “Story Book” Characters parade at his school. 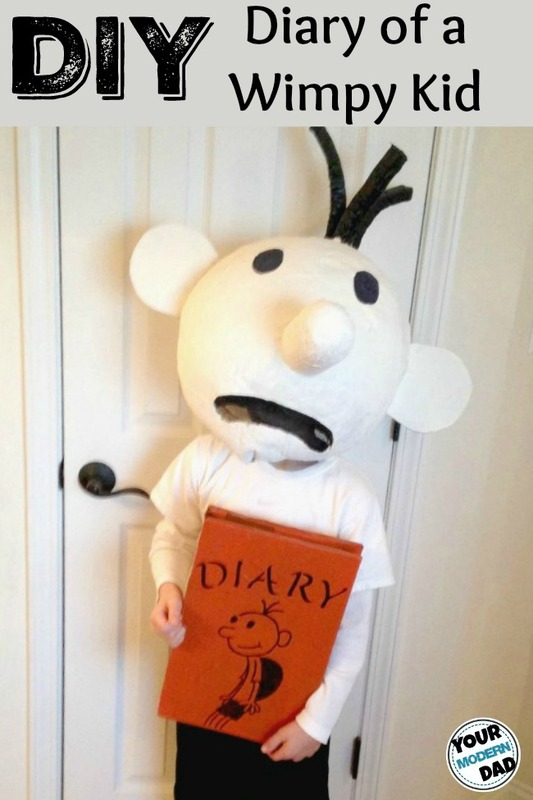 One of his favorites book series is the “Diary of a Wimpy Kid.” There was one problem, it was really hard to find a costume on such on short time frame and to find some just the right one. So… we decided to make one instead. 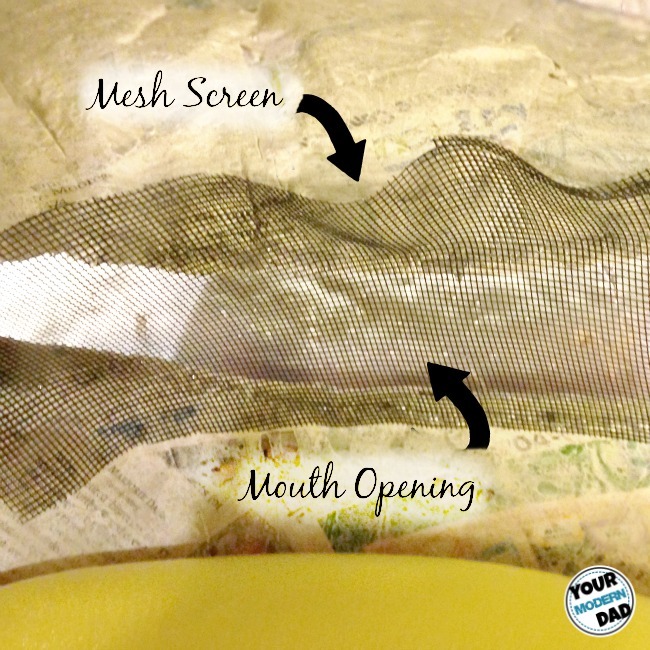 The whole process was really easy and the best part… I was able to make it with my son! 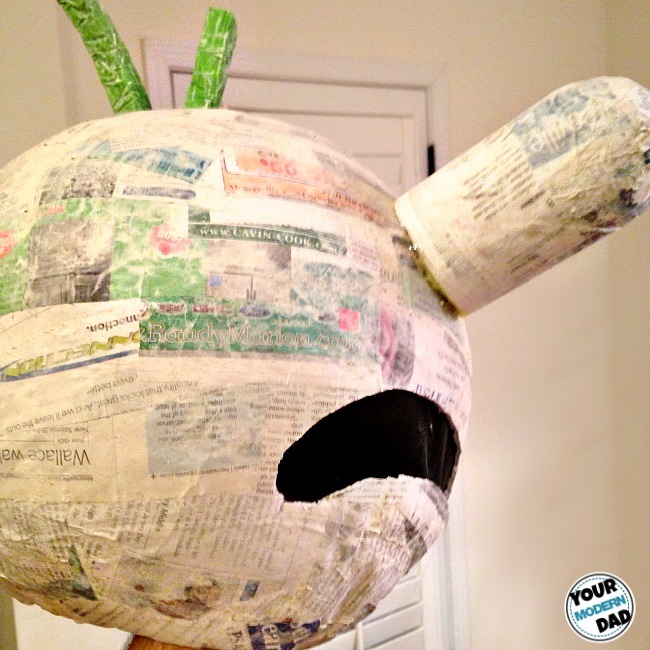 I will go over the sep-by-step directions on how to make the costume. If Diary of a Wimpy Kid is not for you, thats OK! With these directions, you will also be able to make a ton of other characters the same way. Characters like the Teenage Mutant Ninja Turtles, Minions, Dora, Olaf…The ideas are endless. First you will need a cheep beachball. You can usually pick these up at the dollar store most of the year. 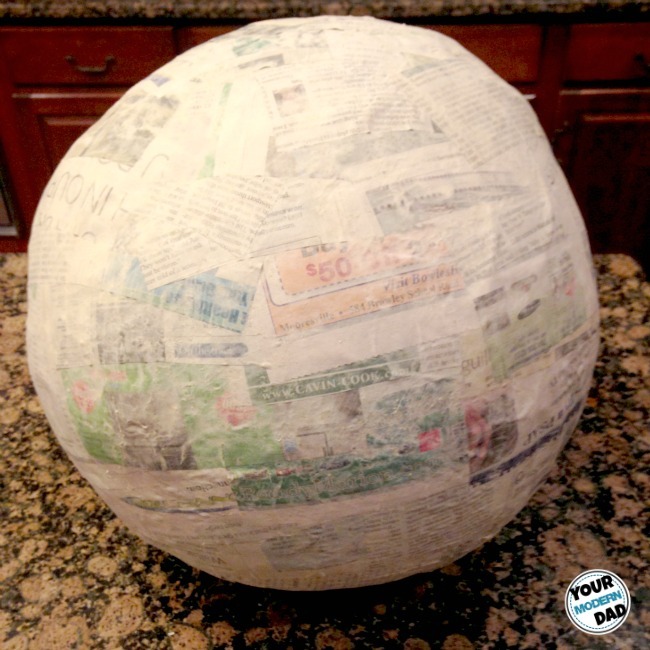 Then you will want to get your items ready to make a paper mache. You will need 1 part flour and 2 parts water. I mixed mine with a mixer just to remove any clumps. It is that easy. Once the glue is ready to go you can begin to cut the strip of newspaper and you are ready to go. Blow the beach ball all the way up and wrap a garbage bag around it and tie it. Then place it on a bowl, with the air valve and tied part or the bag facing down in the bowl. This will allow you to let the air out when you are finished, and remove the ball. Begin to dip the strips of paper in the glue mixture, remembering to remove the excess glue. You do not want it to be too thick, because it will take for ever to dry. Once you have covered the ball in a thin layer, let it dry and harden. Repeat several times until there are no more soft spots surrounding the ball. Now that it is completely dry, you are ready to begin decorating it. First you will want to cut the bag and deflate the ball. The ball and the bag should slide right out. Once removed you can now cut a hole large enough to fit your child’s head. Once the mouth is done, You will want to use something as a “filler” at the top to keep it from moving. I used an old pool noodle and my son wore a baseball hat, which prevented it from falling forward. The pool noodle can also be used to to make the nose. I cut a 4 in piece and then put a paper ball on one end and used some tape to keep it in place. Then I used the hot glue gun and attached it to the mask. 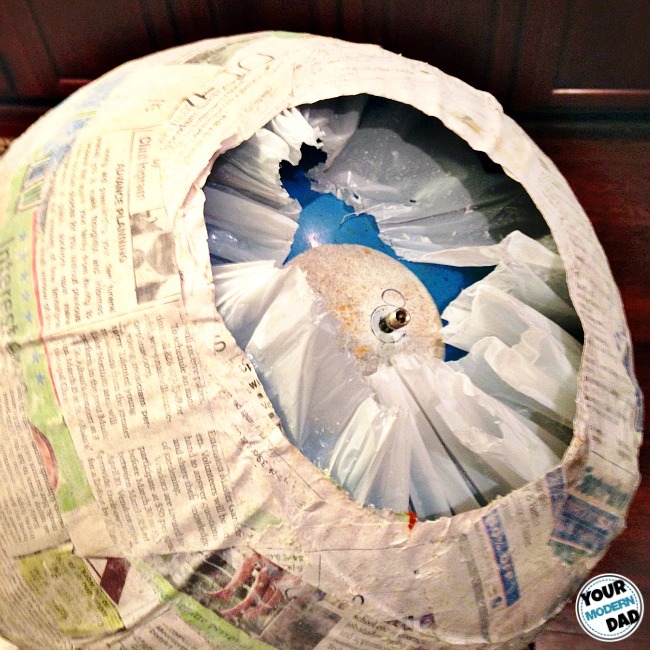 Once attached, I just used some more paper mache and covered it. For the ears and the hair, I did the same concept as the nose. I used some cheap foam board (from Walmart) and cut out the shapes needed and followed the steps. Once everything is completely dry, I painted the mask white and the hair and the eyes black. I matched the rest of the outfit with some shirts and shorts we had around the house and it turned out perfect. 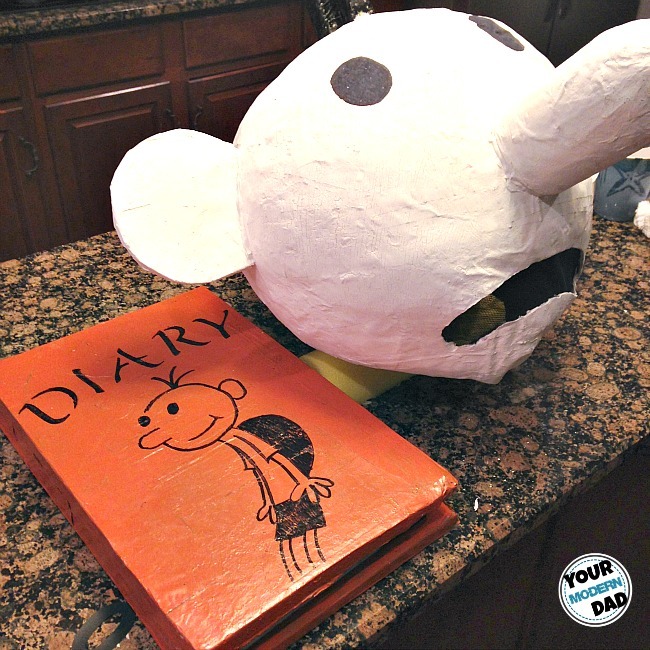 NOTE: To make the book, I used used the foam board and did the same steps as the nose, ears, and hair.